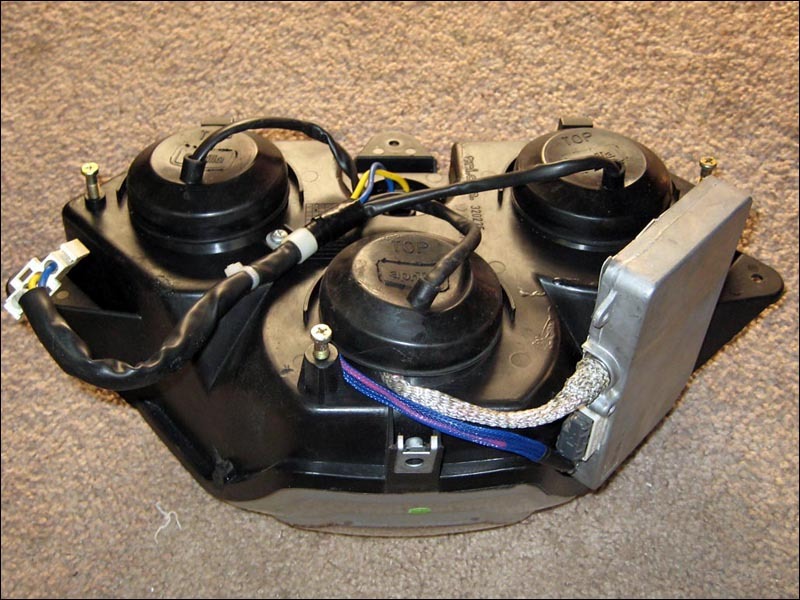 I've always read about people fitting HID ballasts and bulbs on their street bikes and I thought that the price was always ridiculous. I would MUCH rather buy a sweet new helmet or something for that kind of money. But recently my luck has changed. I wouldn't normally do this but a friend of mine has had a pair of ballasts in his toolbox at work for a year now. His wife just had a baby so he was too tired to defend them recently. My bike can definitely use em! 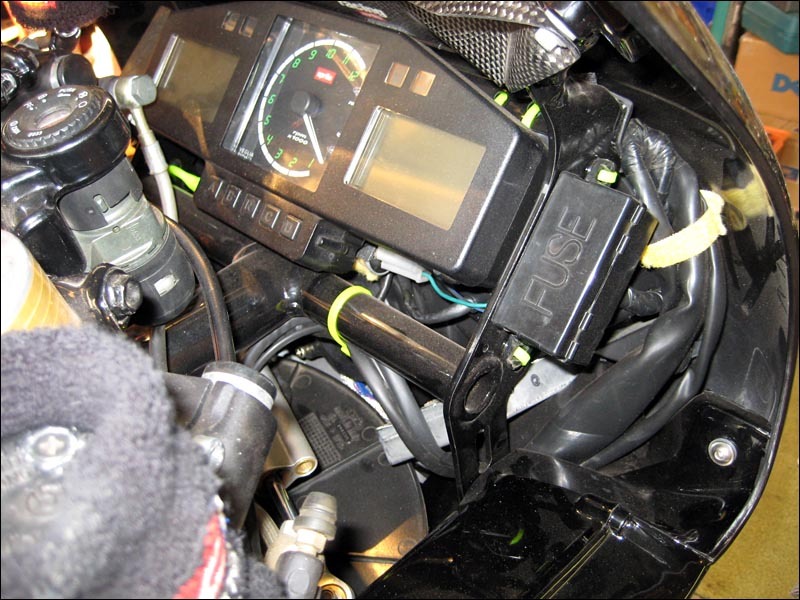 With all the trick parts going on the bike the HID will definitely compliment them. 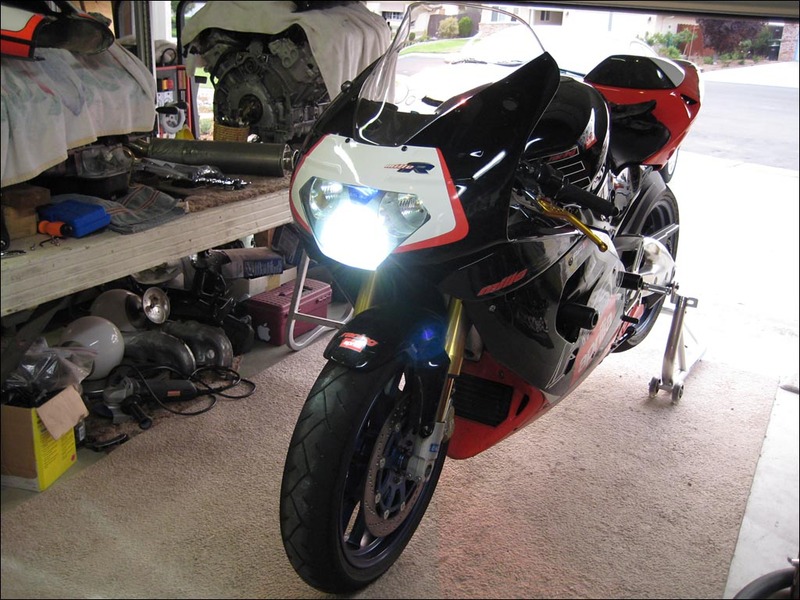 :lol: Now if I could just find the time to install the HID lights on the Aprilia Mille I would be set. And what do you know? Rain is scheduled to be overhead for the rest of the week. Here is what I have. The King of the Obvious says, "They must be from some Toyota vehicle.". 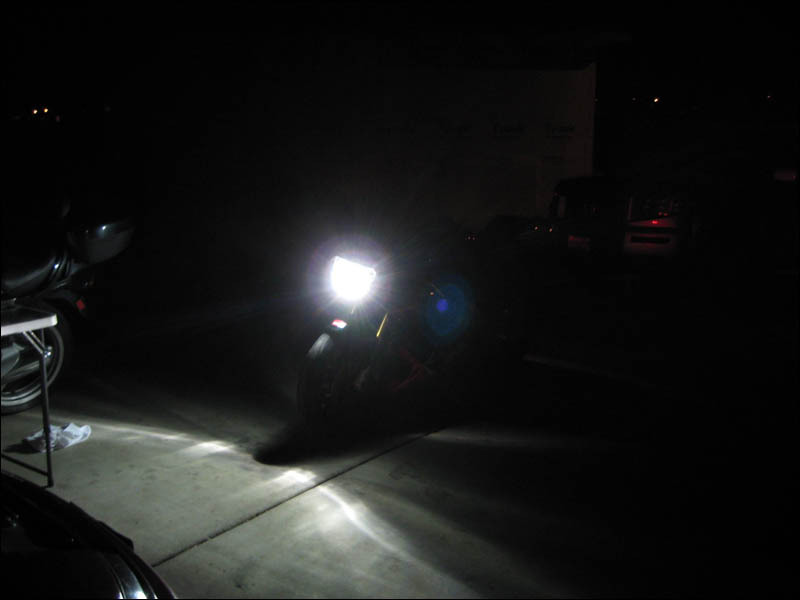 a comparison between the regular Aprilia headlight beam and HID ones. Awesome. I'm pretty happy that I was too busy to install these on my bike! If I did I would have destroyed them in the wreck easily!! I have a ton of work to do on my bike... not sure when I can have time to monkey around with custom HID lights. :huh: I want to but it's just not a huge priority at the moment. Plenty of bodywork left to do! Oh I also scored some PIAA light bulbs that were included in the headlight assembly when I bought it from www.apriliaforum.com member rsvrider16 - thanks man!! Yes I finally had a couple hours today to install my HID light. I just put the lowbeam one in for now because I want it bright all the time. Some time later I might find another one to match my spare so that I can have two going for the high beams. I got a bunch of pictures showing what I did to make this happen. It's wasn't so bad installing it. I was dreading having to place the ballast somewhere but I found THE BEST SPOT EVER... there actually was room inside the front faring and you'll be surprised when you see the location. More to come when I have time. 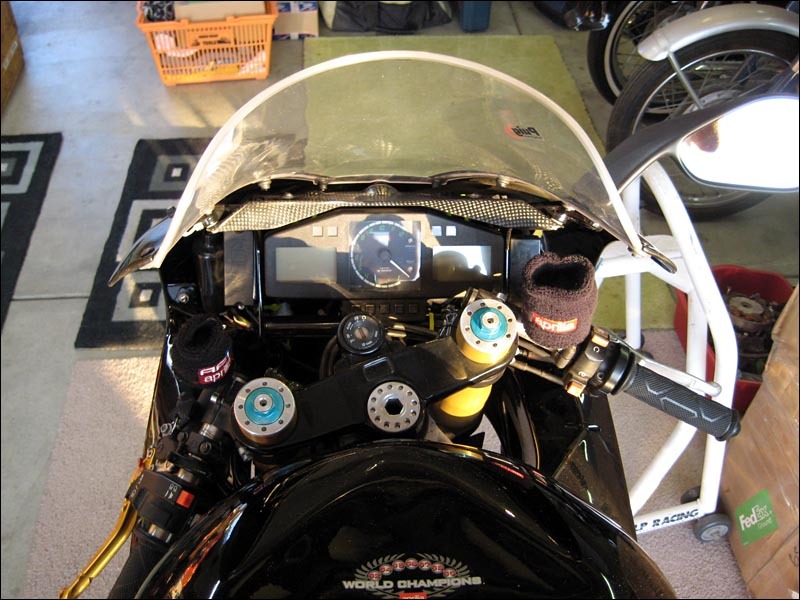 When your front suspension bottoms out or goes near the limit of travel it WILL go all the way up to the upper fairing! This is a horrible place to put a ballast. Here is the best thing I've seen as far as mounting the ballast. There is a shielded wire that goes from the HID bulb socket to the ballast. The high end components that you get from autos always have short wires that are shielded so I figure that it's not a good idea to cut them and make them longer. ALTHOUGH I've been told that it's not a problem as long as you use high quality wire. I'll pass on the extensions. It took me a while but I found a MUCH better place to mount the ballast than the route taken in these two pictures. 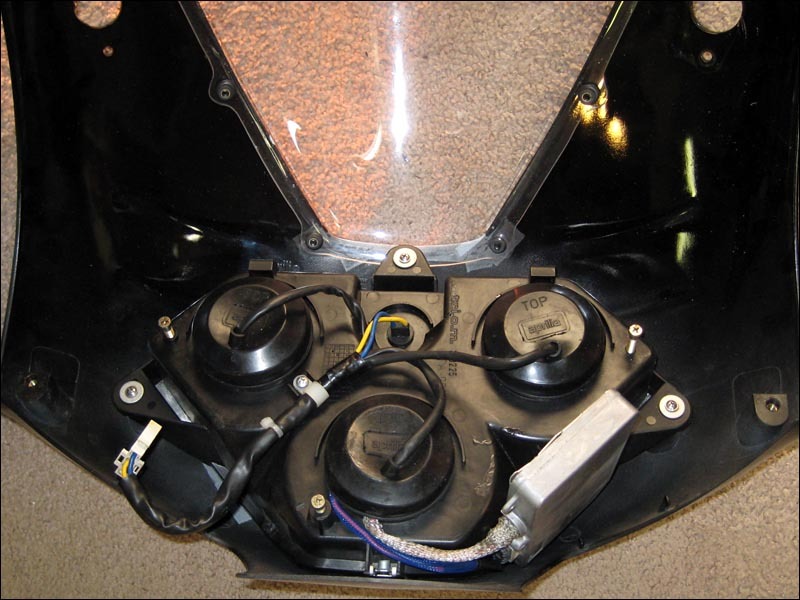 This is the only way I've seen people mount ballasts on their Aprilia Mille but I knew there had to be a better way. DO NOT INSTALL ANYTHING HERE WHERE THIS PERSON PUT HIS BALLAST !! If you hit something hard or use all the front suspension travel the front fender will slam up into anything that is here. 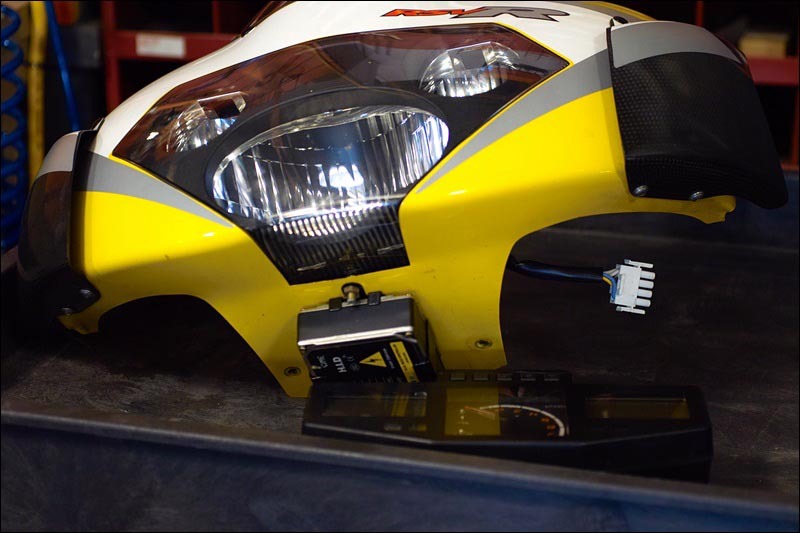 Here is what the headlight looks like with the ballast attached. And here is the front faring while I was fitting things in there making sure it worked like it should. Here are a couple of other shots showing the location of the ballast and the slight interference with the end of the steering cycle to the left side. It just barely gets in the way at the end when you lock the steering to the left. I'm sure I could move it slightly to avoid this and I probably will eventually. I have the Woodcraft clipons installed so they already don't cycle all the way to the left or the right anyhow. You only notice this hindrance when you are trying to maneuver in tight parking places. It's not an issue to me at all. 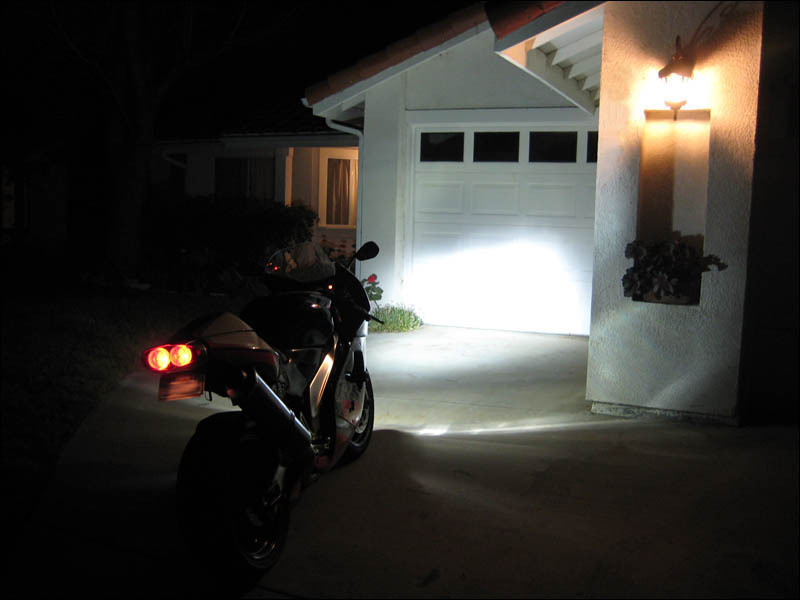 For safety sake I recommend all motorcycle riders upgrade to HID lights. Riding at night is much easier as you can see much more of the road in front of you. Well I rode around tonight to do a shakedown on my bike for tomorrows riding. I posted some info in another forum and thought I would repeat it here FYI. 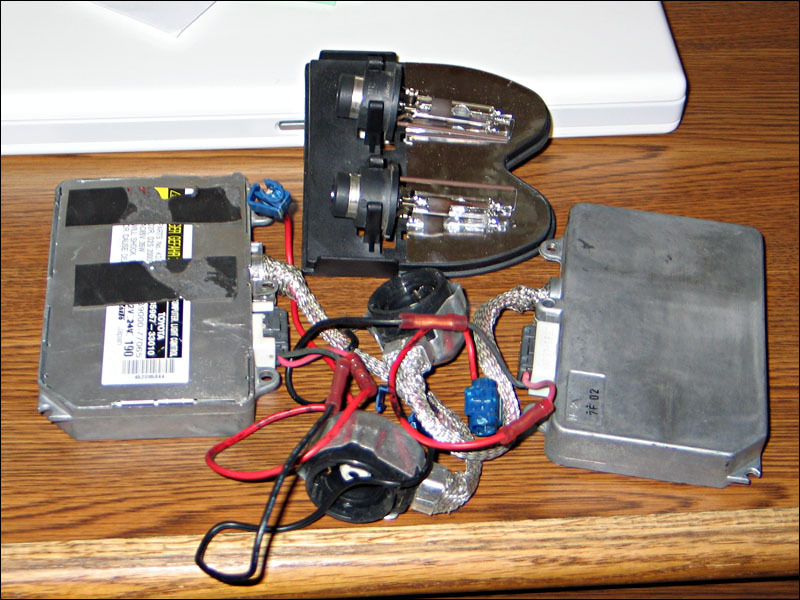 I recommend playing it safe and finding a used HID ballast and bulb from a Lexus or Mercedes. Runs cool and it gets people attention even in the daytime. I have yet to see any oncoming driver flash me at night. If I want to see up in the trees overhead at night time I'll hold my bright light trigger on back roads. Some day I might try some of those Chinese ultra compact HID light ballasts for the two high beam lights. These are a great mod for safety IMO. I'm not one to put blue lights on just to look cool either. I just want to see at night time. The Suzuki V-strom lights still have more light with it's huge reflectors. I can't believe how much light is projected out in front of my friends with just regular bulbs! 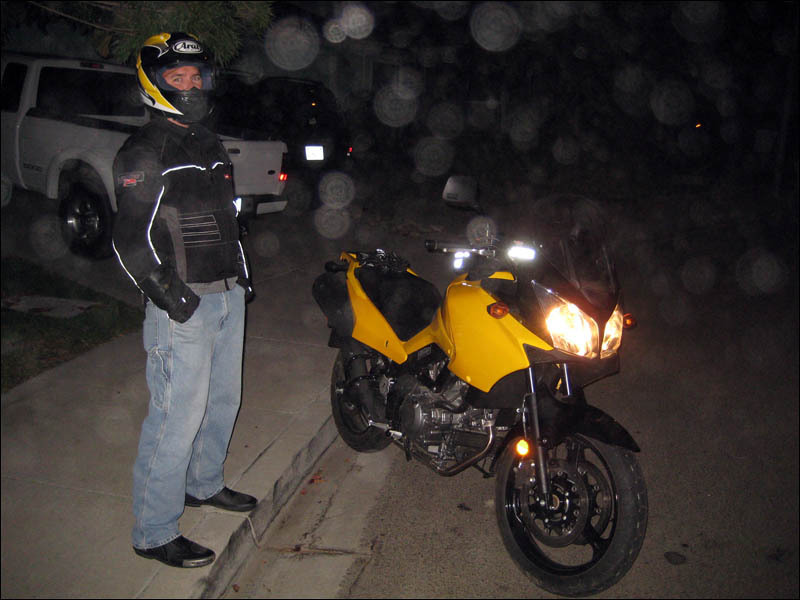 I would love to see what kind of light would come out of the V-strom headlights with HID's installed. Of course they would have to be set up a little different because the high and low switch meakes both lights run low.. and then it changes both lights to high on "high beam". With the Aprilia it runs one light at "low" and then it turns on the upper lights for "high beam". I never took some pictures of the actual beam pattern at night. So the other day after coming back from a ride I decided to get a couple shots so people could see. The housing actually puts down a proper beam pattern so that it doesn't shine directly in oncoming traffic driver's eyes. I was very happy with the result after my install. It's not like some of those cars you see going down the road with HID lights in them that were never intended to have them. I thought I would throw this link in my thread. It talks about the build characteristics of HID lights compared to Halogen bulbs. 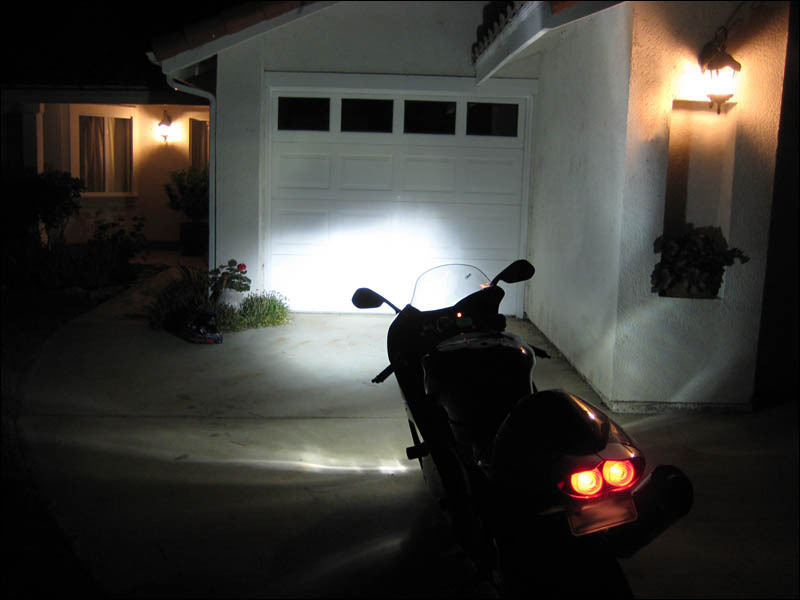 My HID light in my bike throws a nice wide arc of light out in front of me at night but the distance isn't as long as I would like it to be. I'm going to adjust my light a little bit but I'm almost considering installing some tiny driving lights somewhere. Well actually I would like pencil beams lights to throw it out as far as possible. I found this link while a gentleman was discussing this subject after his own HID conversion. He just doesn't get the distance with his HID kit installed so he's probably going back to Halogen. 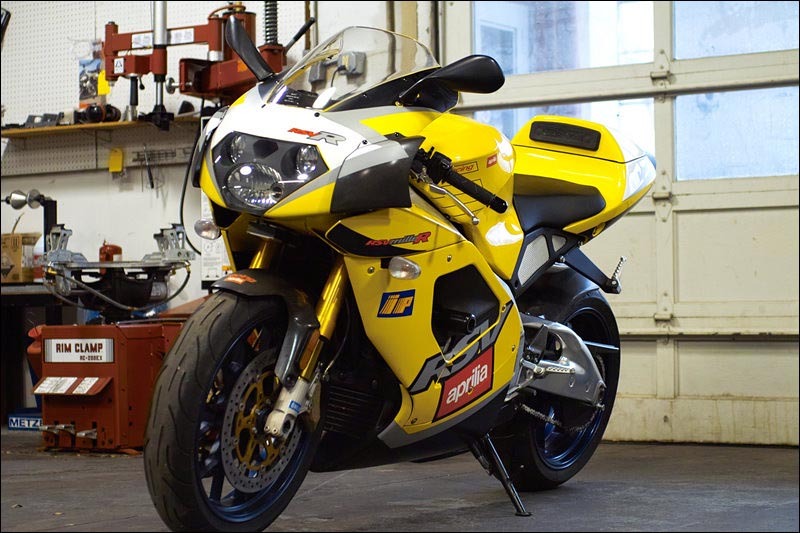 A few people have chimed in to encourage this touring style rider to adjust his HID's for better vision. They made good points about how oncoming traffic notices HID motorcycles much better and they don't get as close as a result. I feel this is a great advantage. Anything that allows me to be seen more is a great plus. Another guy also pointed out how HID's light up reflective tape and signs much brighter. This is also true. I can see road signs three times better with my HID bulb installed. The best thing I think I could do it install some PIAA pencil beam lights in addition to my HID low beam.